Free Shipping Included! Digital Video Action Camera Live Streaming Touch Screen Underwater Cameras 4K 30fps HD WiFi Sports Cam 170 Wide Angle Remote Control Waterproof Camcorder 100ft with 2 Rechargeable 1350mAh Batteries by GeeKam at DJC. MPN: T1-blackk. Hurry! Limited time offer. Offer valid only while supplies last. 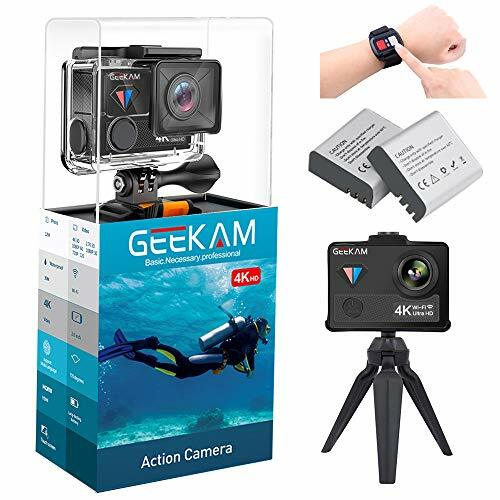 【LIVE STREAMING】--To share your moments on social media with friends you can connect GeeKam T1 action camera to phone via wifi and live streaming to YouTube and Facebook. 【2 INCH TOUCH SCREEN】--Quickily witch between modes, frame the perfect shot, change settings and check out your footage all on the 2-inch touch screen. It makes control of ultra-light, tiny and versatile camera very easy. 【DUAL 1350mAh RECHARGEABLE BATTERY】--Come with two extended 1350mAh batteries, the camera's recording time is more than most traditional 1050mAh battery action camera's. 【TIME LAPSE PHOTO & VIDEO】--GeeKam T1 features time lapse photo and video. Choose the perfect time lapse intervals (either photo or video version of time lapse) to capture change. 【4K VIDEO & 12MP PHOTOS】--GeeKam T1 captures high-quality 4K/30fps video and 1080P/60fps video plus 12MP picture in single, burst and time lapse modes. And 170°wide angle provide you much broader amazing perspective. If you have any questions about this product by GeeKam, contact us by completing and submitting the form below. If you are looking for a specif part number, please include it with your message.